Your Privacy: I never rent or share your address, I won’t email you that often, and you can unsubscribe the instant you get sick of me. Read my Privacy statement. Well, it’s mostly a book full of recipes. 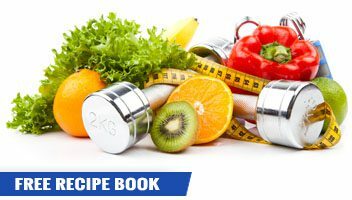 There is slow cooker stuff, information about rescue foods and smoothies, and a wide variety of meals and desserts available from a variety of contributors. Some are quick and easy, others take more work. Some a low in calorie, some have a bit more. It’s food. Eat it. This one takes more explanation, because much of what is in popular media about metabolism is a crock. You’ve probably read and heard a bunch of “tips” and “tricks” for boosting metabolism and turning yourself into a FAT INCINERATING BLAST FURNACE!!!!! Um, yeah. The human body doesn’t work that way. Sorry. Is interval training the holy grail of fat loss? Must you eat six small meals a day? Does breakfast kick-start your metabolism? Will added muscle burn a lot of fat while at rest? Find out the answer in this exhaustively researched report. I’m a syndicated fitness columnist for the Chicago Tribune, Los Angeles Times, Chatelaine and AskMen. Millions read my fitness articles each month. Prepare yourself for some brutal honesty. *You will receive an e-mail shortly with download instructions. Check your spam filter if it doesn’t come through quickly.